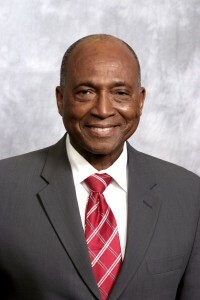 Prior to joining the faculty at North Carolina Central University (NCCU) School of Law in 1979, Charles E. Smith was a Patent Advisor and Attorney Advisor for the United States Army. Professor Smith has also served as counsel for Bechtel Corporation in San Francisco, California. He has been admitted to practice before the U.S. Patent and Trademark Office and is a member of the American Arbitration Association, American Intellectual Property Law Association (AIPLA) and the Panel of Commercial Arbitrators. Professor Smith has published a number of articles and manuscripts on intellectual property and contract law. A past recipient of the Law School’s “Professor of the Year” award, Smith’s principal teaching areas are antitrust, business associations, contracts, intellectual property, patent law, and technology transfer and licensing. Professor Smith is an active member of the North Carolina General Statutes Commission, the New York Academy of Sciences, the National Bar Association, and the AIPLA Section on Intellectual Property. He also works with Habitat for Humanity and Volunteers in Medical Engineering. He serves on NCCU’s Insurance and Sexual Harassment Committees and is the Chair of the University’s Intellectual Property Committee. In his spare time, Professor Smith is a student pilot and studies general aviation. To access Professor Smith’s publications, click here.